Prussian style M91 Reichs kokarde introduced in 1897. Great examples, Brian! Thanks for posting them! A comparison photo of additional kokardes is at the following topic. The cavalry cockades went straight on my JZP Metalhelme as posted here. The one on the left is from a pre 1888 Garde Dragoner helme which is shown in the restoration section and the other is the typical kokarde found on helmets equipped with 1891 posts. A pair of notched M91 style kokarden from my ersatz tin kit helme. Kokarden from these kit helmets in my experience, were always notched but I have only handled Prussian versions of this helmet. Again after years of collecting, notched kokarden are more often found on Saxon helmets. If anyone has a Wurtt or Saxe kit helmet, take a look at your kokarden and make a comment. Sorry, I forgot to answer your question about a couple of unique items you asked about in your first posting on this thread. I see one non-serrated edge kokarden in the National Colors that goes with a Saxon kokarden which would typically be non-serrated. I've seen these specially notched hole kokarden used on filzhaube/ersatz felt helmets. I've also seen these special notched kokarden on the ersatz "kit helmets" made from pressed metal. There's also a Prussian State kokarden with the special notched hole for the m91 side post, and I would guess this goes on a filzhaube or one of the metal ersatz kit helmets. 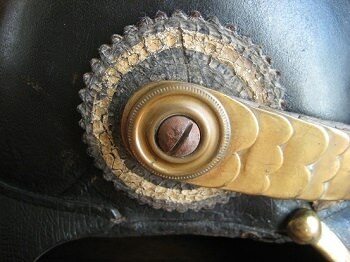 I have as of yet to see one of these special "notched" kokarden on an unmessed with leather body helmet. I've only seen them on the kit helmets, and the felt helmets. Do those answers win the cigar or cookie? You nailed it Alan! 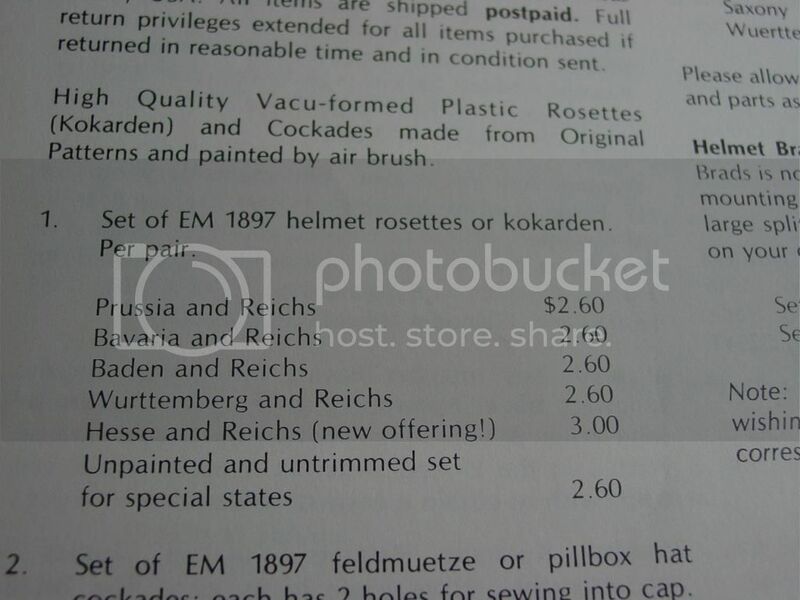 I also just checked my Prussian kit helmet....both kokarden are notched as you described. Anyone else have "V" notched kokarden which are not Saxon or Prussian? Seems to me those ersatz tin kit helmets came with Baden, Bavarian and Wurttemberg wappen. Now wait a minute, are we talking a good old handmade CUBAN cigar (since they're not banned in Canada)? Actually, you 2 confused me now. When I bought my Saxon M15 Infantry EM Pickelhaube, it came without chinstrap or cockades. I went on and got me a pair of non-serrated Saxon Kokarden from Sergio Semino and they both have that notch (see closeup below)... Would these be OK on my helmet? Great post! I had thought of it too but didn't get around to doing it. Hopefully it will become a "sticky" post because it is a very complex issue. Lots and lots of fakes and repros out there. It would be good to see fakes next to originals, especially the rare kokarden for color comparison. Your Saxon Kokarden are fine Ron. I would like to see a pic of the infamous Saxon landes kokarde with serrated edges. Anyone have one out there? 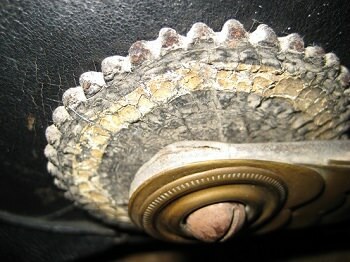 I had an M15 Saxon OR's helmet with original serrated kokarde but had to sell it in the "Loree Divorce" melt down. That is the one! Stop worrying Ronny....there is no problem. Lots of M15s have the round edge kokarden. I would speculate though that the serrated was a war time expedient. I have never seen an M95 Saxon Haube with serrated edge landes kokarde. However, I doubt that "stores" people lost any sleep over this issue! It concerns a national cockade as well as a Bavarian state cockade for a EM95 helmet. Great pics Edwin. Thank you. Now we need the "silver" variation of the Bavarian Landes Kokarde. Yours has the white background but they also used a silver paint. Again I had one on a helmet but.....SOLD! I would also urge collectors to check out the colour on the back side of these kokarden. The Saxon is painted white on the rear side...the Bavarian black with a white front side. Anyone out there know the process by which these kokarden were painted?? I'm assuming the base (e.g. black, white, gray or silver, yellow or gold, blue, green, etc.) was dipped and the rest was hand-painted? Here's my Bayern (Silver) and Baden (Golden) Kokarden counterparts... I know that the Baden Kokarde also came with regular flashy yellow paint, same as for Bavaria. I'm guessing they realized the latter would be cheaper to the war effort? Last edited by RON on Wed Mar 11, 2015 9:37 am, edited 1 time in total. Perhaps it could be a great idea to compare fakes and originals. A Hessen EM kokarde addition for you guys. This one had the entire community stumped for years. It was one reason I did all of that research on the minor states. Anyway Saxe -Weimar changed their color scheme And. Name in 1897. This is an old one as opposed to Brian's new one. I have never seen any photographic evidence of the smaller Saxon serrated cockade. I am not part of the absolute school but I have seen a few pictures. I used to have one. Thought it was original and sold it to James. Police??? There is an older thread that I think Chas started where he laid out fakes and real side by side. I failed miserably to spot the problems but it was very educational. There are photos of a fake Reichs cockade I once bought & returned here. Last edited by RON on Mon Sep 24, 2012 6:54 pm, edited 1 time in total. They look good to me at first sight but I am sure that you are right that they are fake. It would therefore be very informative to have a good comparison of a fake and original cockade. Back in 1992 or so, there was a fellow in the northeastern part of the U.S. who supposedly had a set of original dies for stamping Kokarden. 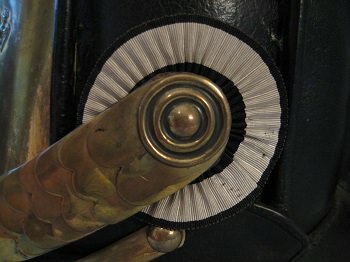 And last but not least, a very interesting combination, a Portepee-Unteroffizier Reichs-cockade and a Württemberg Offizier state cockade, worn on the same helmet (! ), a PB13, GR119 or GR123 haube, which wearer was an Portepee-Unteroffizier der Reserve in peace time (probably a one year volunteer who did not get his Offizier Patent) and who passed to an Offizierstellvertreter during the war, because of great loss of officers during the first months of the war. Both cockades are mounted on german silver M91 side posts, under the typical M15 officer chinscales. Note that the cardboard discs have been originally removed from the back of both cockades, to reduce the extrem tightness between chinscales and side posts. "Laechle und sei froh, denn es koennte schlimmer kommen!" - Und ich lächelte und war froh - Und es kam schlimmer..."
Something that I ran into on a Wurtt private purchase OR helmet with an officer liner and M91 chin scales...the kokarden were non removable. The M91 posts had been put on over the kokarden so they could not be taken off. Has anyone else seen this done? Thanks R1. The helmet I was refering to was exactly like that. The only difference was that it had a private purchase round base spike not cruciform. Then there is this piece of that puzzle. Last edited by RON on Fri Nov 27, 2015 12:48 pm, edited 1 time in total. Standard Mannschaften Kokarden; they fit the M91 Knopf properly, have the correct size and colour and don’t light up under ultraviolet light (not sure if that’s relevant). They even have the lip around the centre hole as if it was punched out from the backside. They are however made from some sort of plastic (light and flexible), that has been chromed or nickelled (visible where the paint has chipped off), then painted black, and finally painted red and white. Don’t know whether these are light-weight originals, ersatz or elaborate fakes. My first reaction is that these are "resin" copies and are thus fakes. The edges of these things are soft and rounded, they lack definition like originals. The colouring though is quite good. b.loree wrote: My first reaction is that these are "resin" copies and are thus fakes. The edges of these things are soft and rounded, they lack definition like originals. The colouring though is quite good. 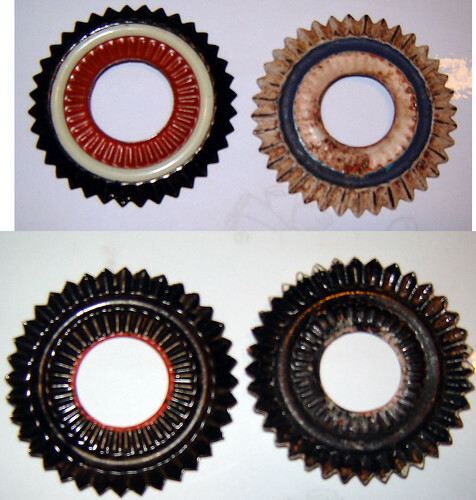 Casting in resin and electroplating is not beyond the reach of home hobbyists. The question is, why plate them and not just paint them, if they're just for show as temporary replacements? You are right on with the colors looking very nice. I bought a helmet once with RTV (Room Temp. Vulcanizing) rubber fakes on it, but otherwise the helmet was good. An easy fix. Unfortunately, I threw those out. Goodness gracious James – well spotted! Yes, that explains everything James! Well done. 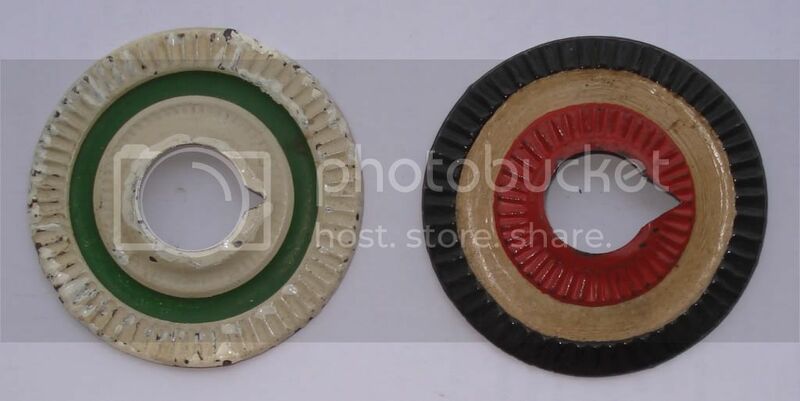 these two came attached to an OR's M1915 helmet, what type of helmet would they suite? 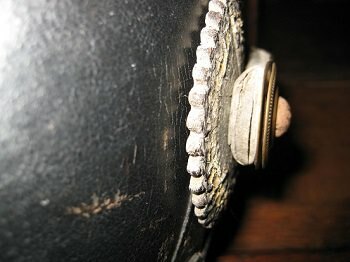 They are essentially standard OR's cockades with the addition of a disc which would have been maybe silver washed when new? They are NCO kokarden and would be ok for OR helmet. J.LeBrasseur wrote: They are NCO kokarden and would be ok for OR helmet. This is another I am curious about, the Prussian cockade is 55mm in diameter and is pictured with a "standard" 48-50mm national cockade. Is this just a manufacturing variation or is it for a specific type of helmet? Any ideas?? I am bit confused Andy....the Reichs cockade (red,white,black) is the larger one at 55mm and the Prussian (black,white) is smaller at 50mm, I think you mixed these up. Anyway, it's obvious what you meant. Cavalry wore larger kokarden so your Reichs kokarde could be cavalry. I have 2 kokarden from my Baden Dragoner (private purchase) helmet that match the size of your Reichs kokarde. Good question. Very good question. In my mind still very grey. there are some anomalies I just cannot seem to square. Size of these seems to be all over the place. One possibility indeed is manufacturer. But I do not know. I visited your country however and believe we have much to learn as a nation from the things you have accomplished in yours. In regard to my Baden Dragoner, it is private purchase with officer style chin scales. However, the kokarden which came with it and I feel are original to the helmet are OR's M91 (large hole). This makes no sense according to what should be there but there it is. 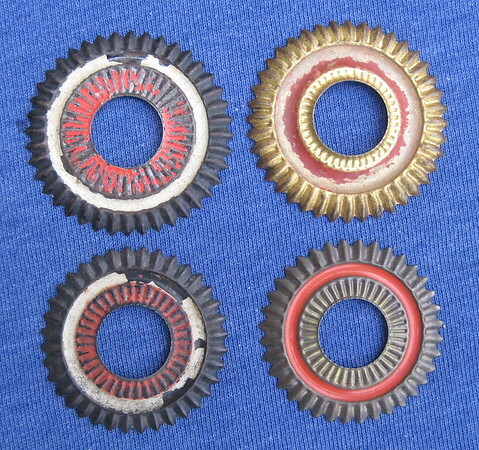 The top pair are from a Dragoner helmet and are the large 53mm size. This Kokarde is on a Model 1809 Kurassier helmet. 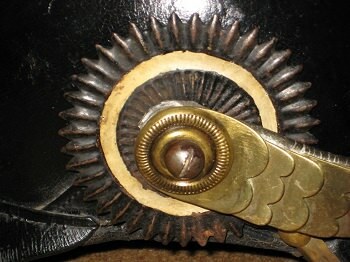 Earlier Kokarden were worn on a tricorn hat. The 75mm Kokarde is made of silk and is colored in standard Prussian colors, black-white-black. Silk is a highly resilient material which can last hundreds of years unless it had been weighted. In the 1840’s manufacturers began weighting silk with sugars and metallic salts to increase profits. It was perfectly legal but the silk material was weakened by it. Weighted silks can dry out, shred, and they do not hold dyes well. Weighted silks also have a tendency to glow under black light, raw silks do not. This Kokarde does not glow under black light. This Kokarde is on a Model 1857/60 Fusilier Helmet. The Kokarde appears, at first, to be made of leather, but a closer inspection reveals that it is made of pressed and painted wool. Pressed and painted wool (like heavy felt) was used on models prior to 1857, so this is likely a "left-over" part from an earlier model. It was probably 75mm at one time, but it has shrunk over time. This is on a Model 1860 Kugelhelm for the Fuβartillerie. The 75mm stamped metal Kokarde was implemented in 1857 to replace the wool Kokarde. 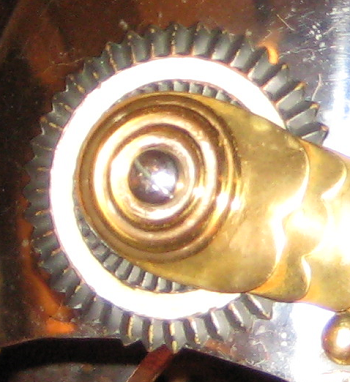 This is on a Model 1853/60 Kürassier Metalhelm. The Kokarde is stamped and seems appropriate in every way --- except size. Prior to 1860 the Kokarde size was 73mm. After 1860 the Kokarde was changed to 63mm. The Kokarde on this helmet measures 68mm --- exactly half way between the two specifications. The Kokarde measures 56mm. It is flat instead of convex, which is typical for Bremen, and it has the Hanseatic Maltese cross. The cross is stamped into the Kokarde and not just painted on. 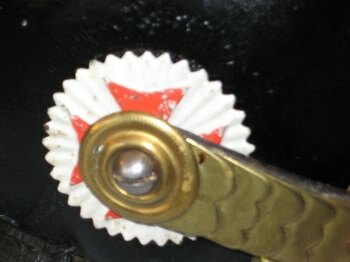 The Maltese cross was used by Bremen until 1897 when the Kokarde switched to a white serrated disc with a red ring. The 56mm stamped Kokarde was implemented in 1860 because of the reduced height of the helmet. Many thanks John, for all your work on this post. Excellent information here on some very rare kokarden. Great stuff John, Will try to add to it as I can. Here is a leather kokarde on a 1. Badisches Leib-Grenadier-Regiment Nr. 109 early pickelhaube. Wurttemberg kokarde. I think it may belong to a dragoon shako.